At Brettenham we are committed to ensuring the children are well informed of the heritage of our country, both in the modern day and historically – celebrating its successes, as well as acknowledging some of its lower moments, within our broad and balanced curriculum. Due to the diverse nature of the school, we encourage children to celebrate the traditions of their families culture and celebrate how multiculturalism in Britain has enriched our society. 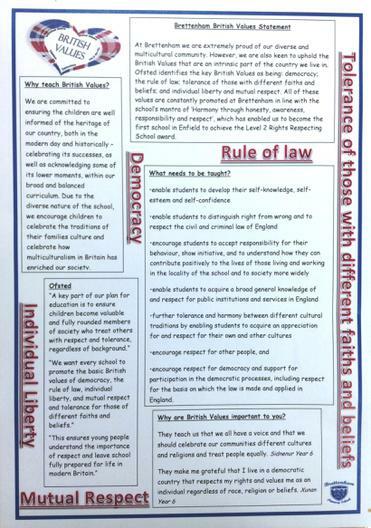 Every week, assemblies on Monday, Tuesday and Wednesday are based around our weekly SMSC values (such as: tolerance, diversity and creativity) are an intrinsic part of what it means to be British and the values this country believes in. Our Monday assembly in both KS1 and KS2 will focus on the British Value of Mutual Respect. Brettenham welcomes our House Captains for 2017/2018. All candidates had to independently prepare and deliver speeches before they were democratically elected.